Knowledge Shop IQ is structured, practice based, training designed to build the knowledge of accountants in public practice. For those on the learning curve looking to boost their knowledge and skill set without the trial and error. For the ones who need to get the job done right the first time, identify impending issues, and take action to resolve problems. For those who want the depth to work with clients in a meaningful way. The depth practitioners need for the client work that only someone at your level can manage. Any Where You Want, Anytime You Want. With Knowledge Shop IQ modules, you're not limited where or when you complete your PD. There will be a record of when you completed the module, how long it took and the results of any quizzes. Once you have accessed your first IQ training module, all other Knowledge Shop IQ modules and webinars you participate in will show on your personal profile. "Much more interactive than the generic webinars I’ve sat through. Engagement level and retention of information has definitely increased." Allocate, Manage and Measure Team Training. How do you know if the training your team are doing is effective? Now you do. Each Knowledge Shop IQ module gives you the ability to allocate training to your team, set time periods for completion, see whether the training has been completed, and view quiz results. 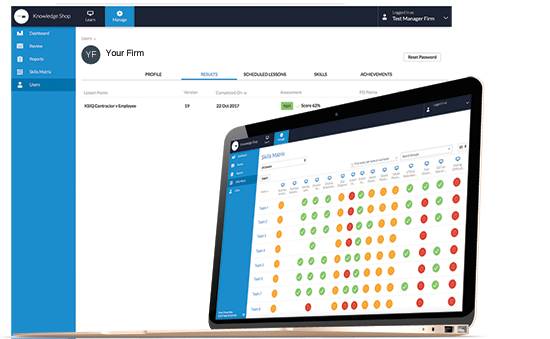 Your firm can have one or multiple supervisors who can see how their allocated team is progressing. IQ modules are a practical insight into each topic with quizzes to test knowledge and understanding.